A great big thank you to all our Granary friends and fans who joined us for the 50th Granary anniversary of the original Granary gig. A really enjoyable night at the Lion with a lovely crowd that packed the place. To quote a title “Nothing’s Gonna Stop Us Now” we will be back at Easter with another Granareunited. Here’s a pic of Granary party people. 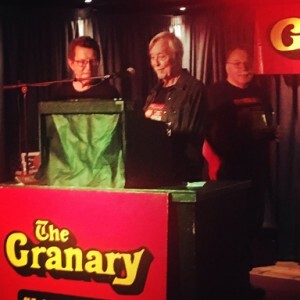 Here’s an amazing picture of three of the Granary DJs on stage at the Lion at the same time (usually one is on stage whilst another is at the bar with the other in the toilet). On this occasion Adrian Coleman was absent at a wedding. Pic Ed Newsom, Al Read, Ade Copley. Our sincere apologies to those faithful Granary fans who follow the news section of the Granary Web Site. Posts covering the last year were completely lost due to a malfunction in an independent memory disc. We will try to post the main points from that period as we regain them though we are pretty sure most of the pictures have been lost. Shame. 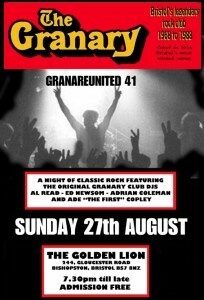 All should be back to normal now so here is the poster of the forthcoming GRANAREUNITED 45 which will remind you that the 50th anniversary of our first rock gig at the Granary should be written in LARGE BLOCK LETTERS in your diary. Did you know that 29 years ago the Granary Club cosed its doors for the last time. However its spirit lives on with a night of heroic classic rock brought to you by the original Granary Club DJs (slightly worn with age but thankfully still standing). Always a great night packed with those rock tracks that will transport you back to those crazy Granary rock discos of the Seventies and Eighties. The next day is a bank holiday so most of you will have time to recover from drinks at pub prices and admission is FREE. Pass to word to your rock friends and neighbours and let us all get together and do it like we did it back then. THE GRANARY LIVES. Super-Ed’s opening set links super tracks with the original Granary beginnings. Taj Mahal - Idle Race - Status Quo - Pink Floyd - Procul Harum and - King Crimson (they were at the Marquee on June 8th just a week or two before their memorable gig at the Granary on June 30th 1969). The canvas of Captain America on the wall behind was painted by Al and is there because the photo shoot was in Al’s flat . 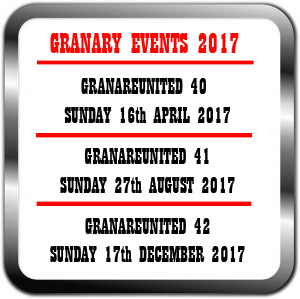 Please make a real effort to join us for our summer Granareunited event and be part of the continuation of the legendary Granary story. Looking forward to seeing you at the GOLDEN LION, Bishopston, Bristol for a wild night of ultra classic rock in true Granary style. THE FINAL PIECE OF THE MOTORHEAD JIGSAW! Throughout 2016 there was a great deal of Granary activity as we tried to pin down the exact date when Motorhead played at the Club. Finally it was confirmed that it was Monday 6th April 1981. 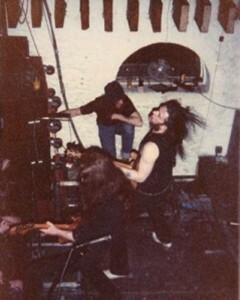 Pictures of Motorhead in action at the club were supplied by Gran Fan Aiden Naughton. Now we can add yet another piece of evidence of this memorable gig that was recently supplied by Gran Fan Dafe (aka Merchant Navy Dave). 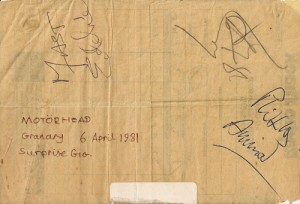 He made his way backstage on the night and collected autographs of the band. A splendid addition to the Granary archives. You can take part by posting your favourite rock tracks and Granary memories on Facebook. 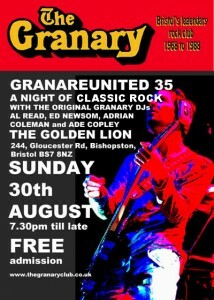 Just search for Granary-Bristol and ask to join. It’s just a couple of months to go to our summer event celebrating the amazing times we had at the Granary. It has been all of thirteen years since our first Granary reunion event and the fact that we’re still here bringing you the classic rock night to remember proves that the Granary always brought you the best in rock - live or on record. Do join us on the 28th August and we guarantee you’ll have a truly memorable time going wild to your favourite classic rock. Bring all your friends - they’ll love it too. PS. DJ Super-Ed is working on a special Prog Rock playlist for the warm-up spot which begins at 7.30pm. Not to be missed under any circumstances. It is sure to feature several of the splendid Prog Rock bands that graced the Granary stage in the 70’s, plus a few more who didn’t, but should have done. I blame the guy booking the bands for that !! Karen has once again provided us with some shots taken at the Granary. This time she had her camera at the ready when MAGNUM played the club on 2nd February 1985. 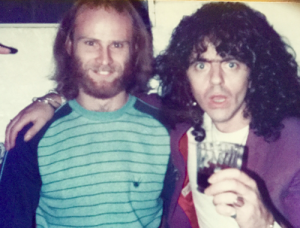 WEAPON, who played the club a couple of times in the early Eighties, sent us this picture taken with Les Pearce who had recently been upgraded from door security to general manager. Wow…that is fantastic news!! It would be so amazing to see photos of him and to hear him playing would be the icing on the cake (quite emotional too) My older sister Lorraine used to watch him play but I was too young. 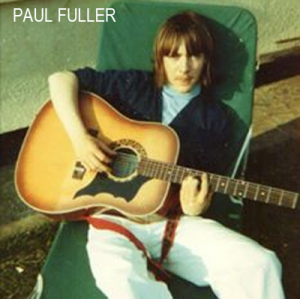 (He was 18 when I was born) He tried to teach me guitar but gave up because I was rubbish. A final post from John Furlong said “And that my friends is why Facebook can be superb”. 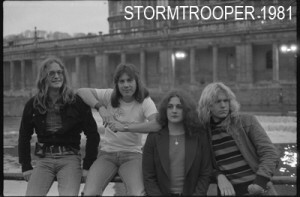 Bristol’s very own Stormtrooper were ahead of the ‘N.W.O.B.H.M’, as they had originally formed in the mid 1970’s. But they were right in there more than holding their own with the likes of Def Leppard, Iron Maiden, Saxon and Motorhead in terms of seeing their music released in the slip-stream of that catch-all ‘brand identity’. 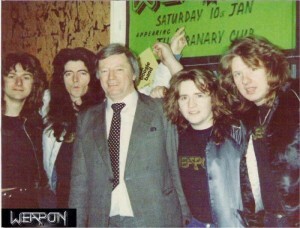 Their passion, talent and ambition enabled them to launch themselves to gain recognition, and their hard work and blistering live shows paid off when ‘Pride Before A Fall’ became one of the singles released through the unlikely means of local Heartbeat Records operation, run by Simon Edwards in Bristol. ‘Pride’ roared its’ way into the ‘Heavy Metal’ chart at 23 in Sounds in its’ first week of release. It reached the heady heights of number 11 after. 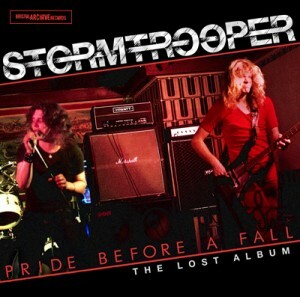 Now the other recordings made by the band in that era, are available on ‘Pride Before A Fall - The Lost Album’. Songs like ‘In The State In the City’ and ‘Still Coming Home’ showcase the bands’ unique blend of Bob Starling’s distinctive and passionate blazing guitar attack, with the driving force of an electrifying rhythm section. Nick Hancox’s technically brilliant and energetic drumming fused with Colin ‘Boggy’ Bond’s knock down the walls bass playing, and his definitive use of Moog bass pedals which brought another dimension to the textures in the music. In the best traditions of a great rock band, this was topped by the rock power and vocal range of singer, Paul Merrell. A lost gem that’s rock gold and is worthy of being in any genuine rock fans music collection. 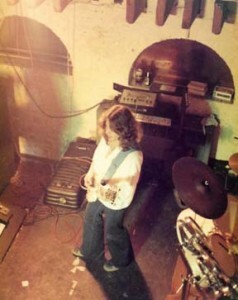 Stormtrooper played the Granary at least five times between 1976 and 1979. As promised in last months newsletter here are some more of the pictures of artists taken live at the Granary that have turned up on the Granary Facebook page. 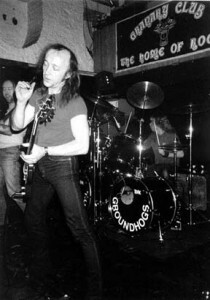 First a slendid shot of Tony McPhee fronting the Groundhogs at one of the six times they played the Granary btween October 1984 and December 1985. They did play a couple of times prior to 1984 but the “Home of Rock” banner didn’t exist then. 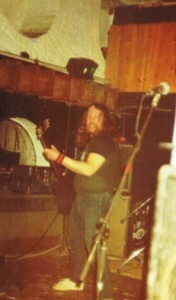 Another tremendous guitarist much loved at the club was Dumpy with his Rusty Nuts who first appeared there in November 1982 and became a regular attraction until the club closed in 1988. 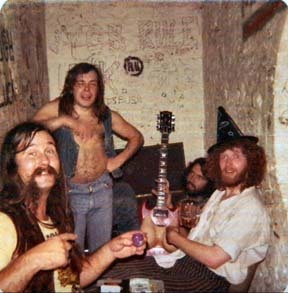 With six appearances at the club between June 1976 and May 1978 the rollicking blues band S.A.L.T. can be classed a regulars and great fun too. Seen here in what the management laughingly called “the dressing room”. 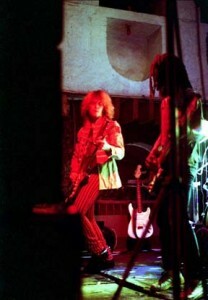 Bernie Torme and the Electric Gypsies played in the summer of 1982 when this on stage picture was taken. 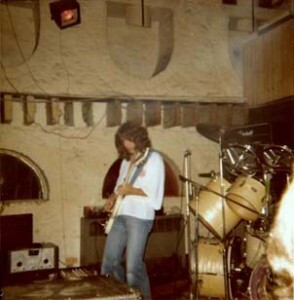 A real feast of photographs taken at the Granary have arrived recently including some from Granary fan Karen Rich which finally confirmed the date of the surprise appearance of Jimmy Bain on stage as Thursday 13th September 1984. The Larry Miller Band were the featured artist at the Granary that night and were joined on stage by Ronnie James Dio and bass guitarist Jimmy Bain who were in town to play the Colston Hall the following night. Larry Miller said that the jam session went on longer than the audience actually wanted and began to chant for Larry and the cried “We love you Larry” when the Miller band returned to the stage. 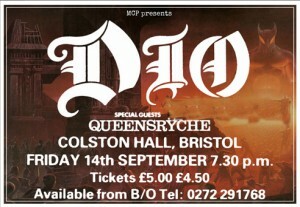 Further information has been added by Mark Jones - Just to point out that Ronnie James Dio didn’t actually get up on stage that night.The possible reason being that he’d correctly deduced that, even with his discretely-stacked boots, he’d still be shorter than the audience whilst up there. Well, that was my pet theory at the time, though I was probably being unkind!.And, yes, the jam itself was rather interminable. (I wonder if anyone remembers Larry Miller’s rather good, privately-pressed LP from around that time? ‘Right Chaps!’ it was called, I think. 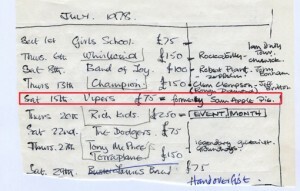 )Granary regular, John Rich, by the way, as seen in the newsletter with Jimmy Bain, also got his photo in Kerrang around that time after winning a competition in the magazine. I think his prize was a guitar from the NWOBHM band, Spider, though I could be wrong after all these years. 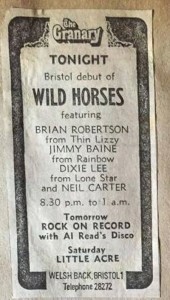 Jimmy Bain was back at the Granary on Thursday 9th November 1978 with Wild Horses. The word has finally come to me….”fortnight!” Yes the Spring 2016 Granary reunion event is just a fortnight away. 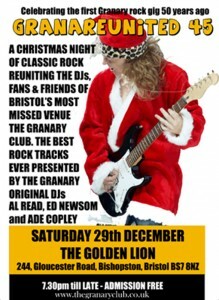 The original Granary DJs will be welcoming to the Lion former Granary Club members, fans, their friends and family as well as any true classic rock lovers or indeed anybody and everybody that loves a damn good time! 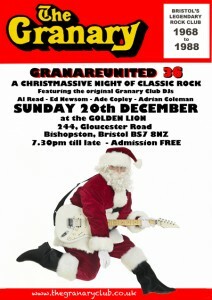 We are looking forward to our Christmas Granary Reunited event - we hope you are too. Please tell all your friends, it’s definitely a “more the merrier” kind of night. Forward this email to everyone you know and let’s all get together again and do it like we used to back in the Granary days. The music will be a non-stop parade of the best of classic rock with a sprinkling of each individual Granary DJ’s personal favourites. Drinks at normal pub prices plus a FREE dip into Santa’s sack of jolly rock pressies! 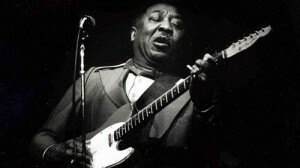 In the few months before the “Plastic Dog” team began promoting rock at the Granary the venue was a seven days a week jazz club but then on 15th November 1968, almost exactly forty seven years ago, the club had an excursion into the blues and promoted the one and only MUDDY WATERS. 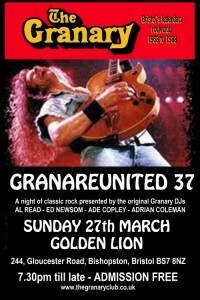 A massive exclusive for the Granary and a brilliant start of twenty years years of music excellence. A new venture for the Golden Lion is the Sunday tea-time good-time music session which this Sunday features LOOSE WHEELS. This is of great interest to the Granary fans of the early Granary days as guitarist and front man for Loose Wheels is Steve Webb. 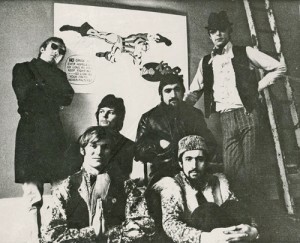 Steve was with prog rock outfit ORIGINN who were on stage at the club in October 1969 and played 9 times in the next 12 months. He then went on to front SQUIDD who continued to feature on a regular basis for the next year or two. Steve then joined Al Read at the Plastic Dog office booking bands and managing artists. Incidentally the drummer with both these bands was the now internationally known fantasy artist Rodney Matthews. 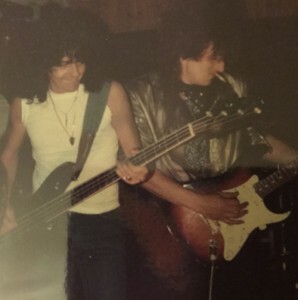 With Steve in both bands was bassist Rich Langham who now also features in LOOSE WHEELS. 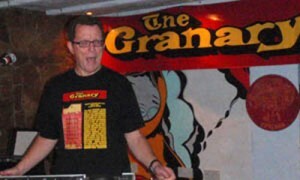 Another Granary favourite was Keith Warmington the amazing harmonica player in both Brent Ford and the Nylons and the Paynekillers. Keith is likely to make and appearance with LOOSE WHEELS if we are lucky. 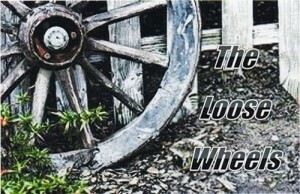 LOOSE WHEELS present a tasty slice of of country, Americana and good time blues at 4pm on Sunday afternoon. See you there. 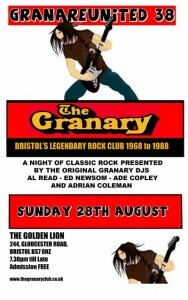 A reminder for you that the Granary team are all geared up andready to bring you a glorious night of the finest Granary styled classic rock.It’s only a few days before the Golden Lion will be soaked in the atmosphere of Granary disco nights.Let’s awaken those memories of the fantastic times we had at Bristol’s favourite rock club.We are really looking forward to your company and, of course, the company your friends as well. It all get’s underway at 7.30pm with Ed, Ade, Al and Adrian at the turntablesplaying those Granary classic tracks (air guitars supplied).Drinks are at pub price and there’s also the Lion’s tasty soul food available.The next Granareunited is not until Christmas week so whatever you do, don’t miss this one.